Facebook is working with a number of partners to prepare for the launch of a music service – possibly called ‘Vibes’ – inside the astoundingly popular social networking site. While you wait, I advise you to check out the amazing +Music extension for Google Chrome (here’s a direct link to the extension). It’s pretty cool. Once installed, you’ll find a new icon in the Chrome toolbar that lets you quickly search for an artist, stream music and discover links to the artist’s profiles on Facebook, Rdio, Wikipedia, Last.fm and whatnot. The music gets fetched from Blog MP3s or Rdio (subscription required) and you can click the icon to play and pause music mixes, jump to the next track or queue songs. On any web page you visit, you can now highlight the name of an artist, right-click, and instantly play or queue a mix of songs from said artist. The video below shows you how that works. Now that’s all really nice, but here’s where it gets interesting. 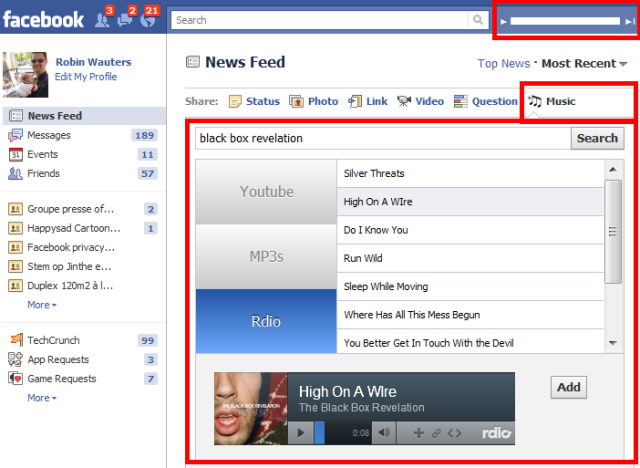 +Music integrates deeply with Facebook and allows you to share full songs with friends, even if they don’t have the extension installed. It also adds a layer of usefulness on top of Facebook, so when you visit the social network you’ll see a number of enhancements that will enable you to enjoy music with a mere click of the mouse. For one, on top of Facebook you’ll see a mini-player that lets you play, pause and skip tracks, so no more need to open the +Music dialog box by clicking the icon in the toolbar. In the ‘Share’ section, you’ll also see a ‘Music’ option that lets you search for an artist, album or track where you’d normally post a status update. You can use it to share YouTube videos or instantly streamable songs or even full albums (MP3s found on blogs Web-wide, or from Rdio). The screenshot below gives you an idea of what it looks like. To achieve the above, the add-on uses Facebook’s Open Graph protocol to embed streamable music when you share a track – no authentication required – while the swarm.fm website acts as a home for any content shared via +Music (with more to come, developer Peter Watts tells me). It doesn’t stop there. The +Music extension also spruces up artist or band pages, adding a button for instant music streaming or queuing next to their name. 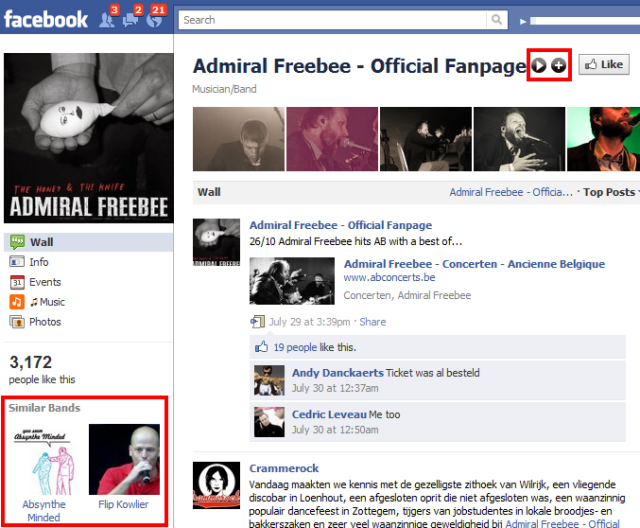 In addition, the extension shows you similar artists or bands in the left column of their Facebook page. Again, see screenshot below. Much of the technology behind the +Music extension is powered by The Echo Nest. If you’re interested in other nifty music apps, be sure to give Ex.fm and Shuffler.fm a whirl.